Recently I had occasion to reread Harold and the Purple Crayon, Crockett Johnson’s 1955 book about the tiny, pajama-clad Harold. This young boy goes on an adventure one evening, leaving behind the comfort of his bed to walk in the moonlight. I remember this book from somewhere in my childhood; and as an adult have always had a soft spot in my heart for Harold. Along his journey, this young boy confronts several obstacles. With the help of his purple crayon, however, he overcomes them easily. Reading this book today, I find a lesson I suspect my younger self never recognized. I used to think that Harold is a triumph of childhood imagination. No doubt that’s true. But this book also tales a tale of self-efficacy, which is the “I think I can” that gets us to our goals – whatever those goals are and why we have them, whether they come from within ourselves or are imposed by outside circumstances. Harold’s purple crayon is his self-efficacy, the tool he uses to help reach his goals. First, the goal of having an adventure, then the goal of finding his way home. When Harold reaches the top of a mountain and there’s nothing on the other side, he simply draws himself a balloon and basket and lands safely on the ground. When he found himself drowning in the sea, he drew himself a trim little boat and sail. It’s no matter that some of these predicaments are a result of Harold’s own limited thinking. Why would he need to consider drawing the other side of that mountain when he starts out? He only needed the mountain to get up high enough to try to see his bedroom, so he could find his way back home. After his initial adventure, Harold wants nothing more than to get back home, back to his own bed. And when he can’t find his home no matter where he looks, he remembers that home is already within himself, that he’s already home. So, he uses the purple crayon to draw the view he remembers from his bedroom window and suddenly he’s back in his room, in his bed. Where he draws up some covers and falls back asleep. Maybe this is way too deep a read for little Harold, who just liked to use his purple crayon and his imagination to have adventures. But this footy-pajamaed little boy is a simple lesson in taking care of ourselves, that we have within the power of adventure, the power to strive for our goals, and the power to solve our own messes and find our way home again. 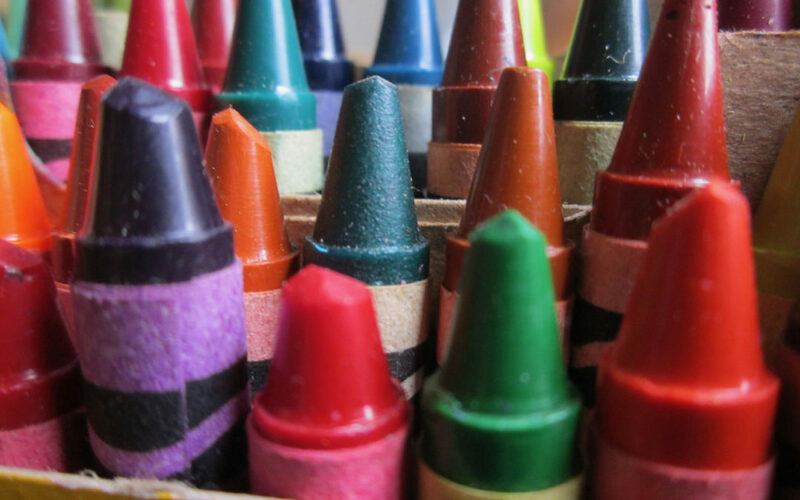 What color is your crayon?